After a three-year wait, Zenit has finally released its long-awaited superfast Sony prime lens: the Zenitar 0.95/50 for Sony E-mount cameras. This is the first of a number of ultra-wide, manual focus, nifty fifty-ish lenses being released for various formats in 2019: the Nikkor Z 58mm f/0.95 S Noct for Nikon’s Z system cameras, the Kamlan 50mm f/1.1 Mark II (the “Bokeh Beast”) for Sony E, Fuji X, Canon EOS M and Micro Four Thirds, and the Mitakon Zhongyi Speedmaster 50mm f/0.95 for Nikon Z, Canon RF and Sony E-mounts. 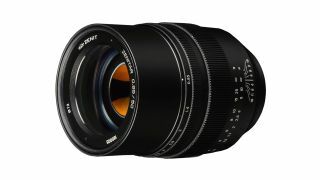 First revealed back in April 2016, the Zenitar 50mm f/0.95 prime is Zenit’s first E-mount lens and boasts 14 aperture blades to create pleasingly circular bokeh balls when shooting wide open in low light conditions or for creative background blur. “Thanks to improved optical calculations, we've managed to achieve a sharper image result. The unique appearance of the photos should be appreciated especially in artistic photography,” said Vadim Kalyugin, CEO of KMZ (producer of Zenit cameras and lenses). While the Noct is expected to cost some $6,000, the Bokeh Beast sub-$200 and the Speedmaster around $900, the Zenitar 0.95/50 is available now for pre-order for 650 Euro (approximately £555 / $735). “The product quality is not inferior to foreign counterparts and its affordable price will create a successful competition. This new design will without a doubt take the Zenitar brand to a completely new level," he added, describing it as “a lens for thoughtful photography”. While its USP is the f/0.95 aperture, it stops down to f/16 and possesses a minimum focusing distance of 70cm. Measuring 117.5 x 85.5mm and weighing in at 1.2kg, with 9 elements in 8 groups, it’s not a slight lens, but the size and heft should make it more manageable for manual focus shooting. This isn't Zenitar's only crazy-fast lens. At Photokina 2018 we went hands-on with the Zenitar 35mm f/1.0 for the Zenitar M / Leica M mount – the lens being designed for and bundled with the Zenit-Leica full-frame mirrorless collaboration, the Zenit M.